Internet has become a necessity; several non-computer and non-smartphones devices like fridge, automobiles are all now getting connected. But for them security is not of utmost importance due to which shielding them from cyber criminals is becoming difficult. Internet of Things indeed is a great technological advancement but we cannot risk our home safety because of it. As, there are antivirus programs available that can protect our smart devices: Smart TV, Car and other from being attacked, we must be extra cautious while using these devices. Not using technology due to the fear of being hacked is not good. By protecting our Wi-Fi network, we can avoid transforming our smart devices from being a backdoor to spread infections. When we don’t leave our home unlocked while going outside then why do we leave our smart devices on for hackers to exploit them? Internet of Things, a name given to everyday devices connected to the Internet, it includes refrigerators, vehicles, wearables and many other devices. These devices make our lives easy but there is a great risk involved in using them. To understand things better let’s take example of a fitness band, as it monitors user’s location, routine and keeps a record of all these things. Imagine if a burglar gets access to this information then what can happen? He can get into the house when you are not around or can track you down wherever you go. Don’t get scared after knowing all this, because you can protect yourself by taking care of certain things. IoT devices are connected to Internet in some way or other, networking setup makes it possible and keeps them connected via an Internet Protocol addresses essential to stick to network-security basics. But securing these devices from attacks is nearly impossible, therefore user must pay attention to the basics and try to protect boundaries. They need to understand that a connected device can be compromised anytime, therefore it should be turned off when not in use and security should be keep in check. Things don’t end by just connecting the device, you need to even monitor it to keep your data secure. How To Secure Connected Home? 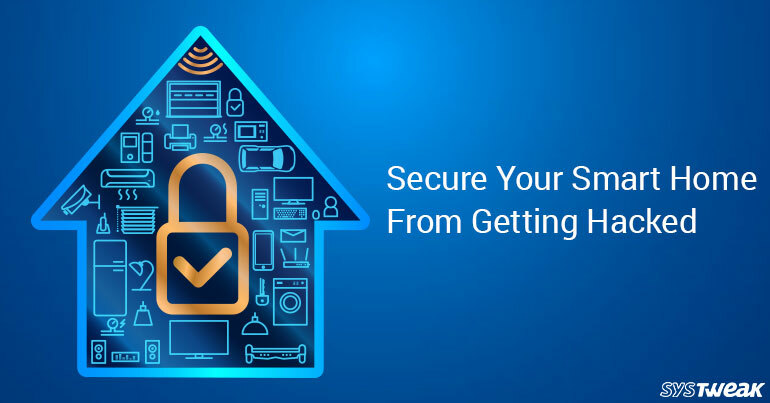 Using following steps, you can try to protect your home network and the gadgets connected to it. As the old protocol Wired Equivalent Privacy (WEP) is most commonly used one needs to be cautious. WEP is weak and can easily be compromised therefore instead of using it users should try using Wi-Fi Protected Access II (WPA2) protocol as it is stronger and has a complex password. Hackers try to get hold of your personal information from your Wi-Fi or SSID name therefore don’t name them by your name, home name or any other detail that may reveal your personal information. As they use all this personal information for social-engineering attacks. Instead of naming them with obvious name you can name them as “Dead Walking”, “Zombie” etc. Guest access is commonly exploited by hackers therefore when giving guest access allow them minimal rights and keep an eye on who or what is trying to access your network. As you can use them to connect different devices, making it hard for hacker to identify with which SSID your smart devices are connected. This can only happen if you have a router that can handle multiple SSIDs. If that is the case then use one for computer devices and smartphone and other for smart devices. Using default admin password is like locking the door with the keys in it. Hackers always try to get into your network by using the default password as most of us don’t change it. Therefore, changing it to a complex and stronger password that is hard to guess is a good idea to keep your device secure. Running a Firewall to secure network is first step towards protecting your device, as it helps to keep incoming connections in check. If any suspicious connection requests access to your device it will be blocked there by the Firewall thus avoiding access to any information. Plus, you can set firewall to allow traffic from trusted ports avoid giving permission for a wide-open access. It helps to secure the highly-connected home from intrusions and provides network antivirus protection. Once the network is secured it’s time to check functionality of IoT devices individually. First and foremost, disable remote-management access when not in use. Plus, if you don’t want to use your social media account with any of the smart device then there is no need to setup the connection and provide the credentials. Install security software to keep apps installed in phone in check, as hackers can easily use an app to access your smartphone. An anti-virus will be able to detect any malicious behavior and will inform you in time before intruder takes a step. Updating firmware is a great idea as it helps to secure networking gear such as firewalls and routers. Security companies are aware about the approaching threats instigated due to Internet of Things devices. Therefore, they are developing new features and products to protect them from malware attacks and strengthen their security. But with the increasing number of smart devices it seems soon there will be an explosion before any safety measures are ready to be taken. You may not have seen attacks targeting IoT devices by this doesn’t means they aren’t there. They are approaching slowly cybercriminals are just looking for ways to hack into IoT devices once they can exploit them then there is no going back. They will be able to drive your cars, control your home access and other things. Just imagine what would it would be like if one-day hackers are able to regulate all your devices.